Professor Walter Veith, Amazing Discoveries to purchase DVDs. Search engine to view Utube lectures. From a mainstream point of view, the King James Version of the Bible is the most hated book on this planet. All the most powerful people in leadership positions really hate it and have done their darndest to anathematize it. They have brought out a plethora of cheap and nasty modern versions, which contain deliberate and purposeful changes in the text. Modern scholars claim they are more enlightened than ancient scholars, and they have "gone to town" on the sacred text, bulldozing away all the precious and highly significant readings, and replacing them with cheap human based dogma. This subject of why are there so many versions is a very interesting and vital subject, and it is well worth knowing the facts and truths surrounding it. You will be shocked when you see for yourself just how vicious the attack has been on the Bible. Although I myself cannot offer a scholarly treatise on the subject, I will recommend a valuable book - THE BATTLE OF THE BIBLES by H H Meyers - and also the lectures given by Walter Veith on this subject. It is easy to see why Satan and his subjects really hate the true bible - - because it (only the KJV and other translations from the textus receptus) exposes him and his deceptive arts. In all the modern translations, the explicit precision has been removed and replaced with generalized phraseology, allowing the reader to "spiritualize away" any of the succinct and definite precepts. Basically the bible becomes an "anything goes show", and you can just believe what you want, because you can't substantiate anything from these jesuit bibles.... and that's just the way the devil wants it. However, thank God we still have the Holy KJV Bible which is an accurate and concise document, which has stood the test of time. There are several key doctrines which can only be well established from a study of the KJV. 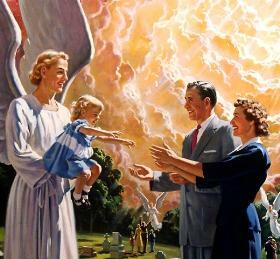 These are: 1) The Nature of Christ, 2) The State of the Dead, 3) The Sabbath Truth, 4) The Investigative Judgment, and 5) The Second Coming of Christ. These doctrines in particular, - the devil really hates, and he has his own counterfeit doctines which could be stated as - 1)The Immaculate Conception 2)The Immortality of the Soul, 3)Sunday Sacredness, 4)Purgatory, and 5) The Millenial reign of the Universal Christ. BEWARE PEOPLE..!..! IN THE NEAR FUTURE - - SATAN WILL IMPERSONATE CHRIST... AND DECEIVE MILLIONS into believing that Christ has returned to set up His Kingdom and reign here for a thousand years. Don't be fooled. 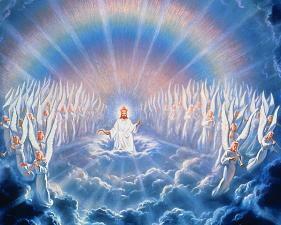 We are warned about many false Christs and false prophets. The Bible is very clear about the circumstances surrounding the 2nd Coming of Christ - and what's actually going to happen. Christ will return with power and great glory - - every eye shall see him - - His feet will not touch the ground - - the righteous dead will be resurrected and with the righteous living will be caught up into the air together with Christ, and they will spend one thousand years in Heaven (which is in the Orion constellation) - - the wicked will be "put to sleep" during that thousand years - - the earth will lie in waste with no human soul on it, with Satan and his fallen angels trapped here with no one to tempt or harrass. After the thousand years, the wicked will be resurrected to live for a short time, then will come the final judgment - the complete removal of Satan and his followers, and the re-creation of this earth. Sin will no longer exist in the universe. Soon the authentic KJV Bible may become very hard to obtain - as there is a strong dislike for it among the ideological cultural social manipulators - - and they control governments, banks, churches, medicine, education, entertainment and the media. God has had His agents in these corrupt organizations, who have been holding back the full force of their evil. Gradually, these faithful few are being removed, and there will be a short period of severe trouble just before Jesus returns. It would be good for you if you avail yourself of the all the opportunities in these last days, to make sure you are standing on the right side of these momentous issues. One very effective means to combat the confederacy of evil is to fix God's word in your mind. When they take the bible away from you it won't matter so much - - because you have it hidden in your heart. 1) An "eye friendly" text and colour format. 2) A continuous scroll design for quick "look-up". 3) Unique "line upon line" style for easy reading and quick comprehension. 4) Multiword search. Two word proximity search. Phrase search. 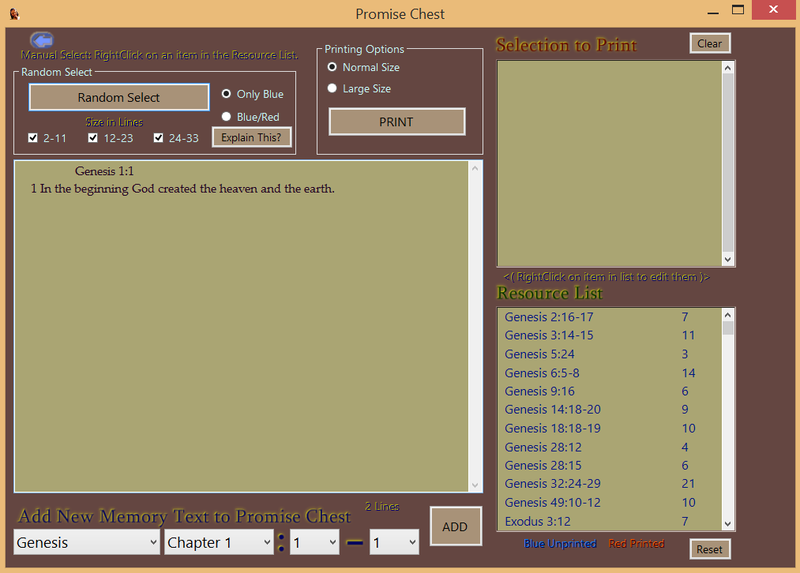 1) Easy and quick memory verse selection and printing. Economical use of ink and paper. Everything is completely editable. 2) Ability to quick reference then copy and paste (into other applications such as email or Word. 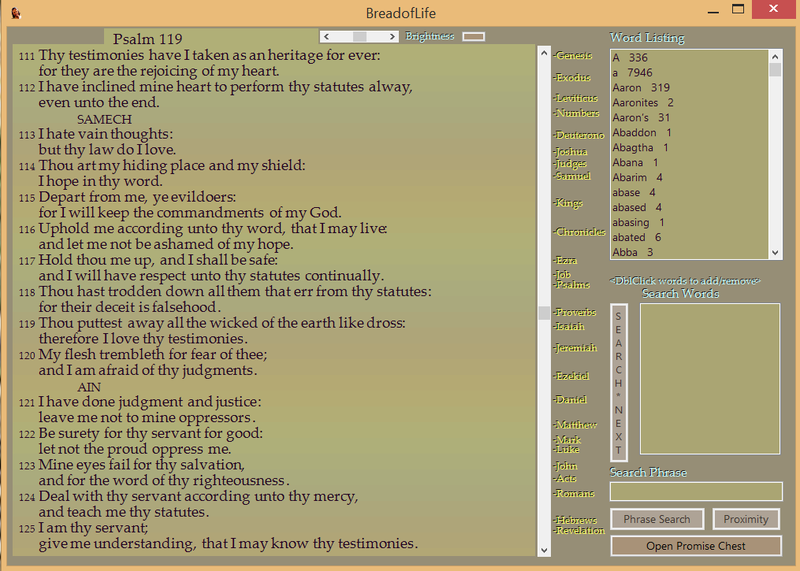 Breadoflife is a compact stand-alone windows application which uses little resources. The whole Bible is included, and the download size is only 2 meg. Download BreadofLife:- - FREE ! Then enter the newly created [BreadofLife] folder - you should see the following - and doubleclick on the [Setup] file. Follow the prompts. Holp up faith's lamp to show my Saviour near. Show me the glory gilding Jordan's wave.